Always, I am fascinated by what I learn in wildlife rehabilitation. During the time when the little orphans we raise require constant care, however, it is easy to overlook gradual changes in appearance or behavior, and even the development of individual personality, because we tend to them and observe them so many times each day. Then suddenly, we realize that what was one day pink, hairless, and oh so vulnerable with eyes sealed shut, is now a fuzzy ball of fur, with eyes wide open to the wonderful, new world around it – scampering and scurrying about in playful joy. But I have found the most fascinating, and sometimes surprising, realizations come later, when I am able to observe them in their natural environment – the woodlands. One such experience came just recently, when I was busy cleaning the wildlife watering hole (an old bathtub) we keep filled at the base of the slope behind our home. That old cast iron tub has served many purposes, after being discarded by humans long ago. It was a watering vessel for horses for many years but, after we no longer kept horses, I filled the old tub with dirt and turned it into a planter. Unfortunately, that did not work out very well at all, as it got too much sun in the location it was in. So then, when we acquired an abandoned Easter duckling that someone discarded at a city lake (and we purchased a second duckling to keep it company), that old bathtub became a swimming hole for the two of them to paddle around in. Later, when orphaned Daisy deer was set free, I had FD move the tub down to the canyon floor to serve as a wildlife watering tub. Every week since that time, I have cleaned the tub and kept it filled with fresh well water. This is a bit of a chore, but I love knowing it provides year-long hydration for all sorts of birds and mammals – and especially for my Daisy deer. Being as connected with nature as I have become since moving on this place, I often sense when I am being watched. I know that sounds silly, but I cannot tell you the number of times I have had this feeling of being observed, only to spot an animal or bird staring at me! So, when I felt it again while filling the tub with fresh water the other day, I looked around, then up and in the tree just next to the water tub. Sure enough, I spotted two squirrels perched above me. Considering their smaller size, I guessed them to be juveniles, and they appeared to be grooming each other. Just above the wildlife water tub I spot two squirrels grooming each other. 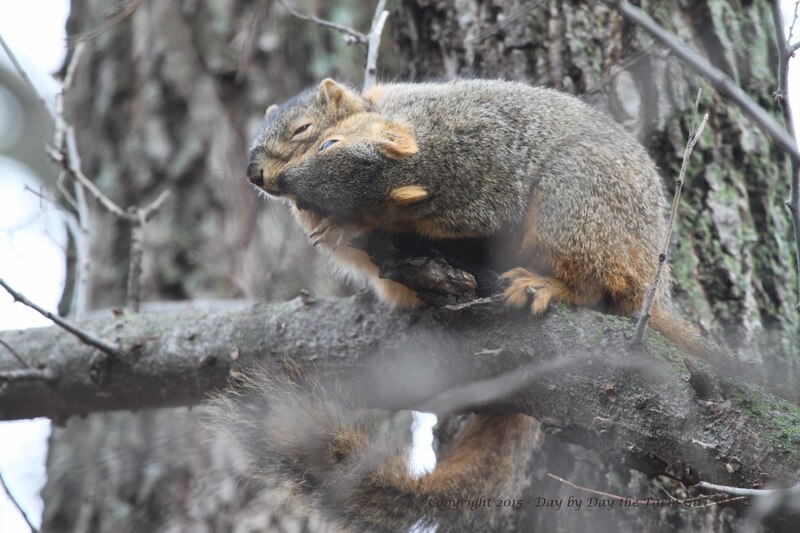 Having never observed squirrels performing the act of mutual grooming in the wild, I slowly stepped back and walked carefully up the slope and into the house to fetch my camera. 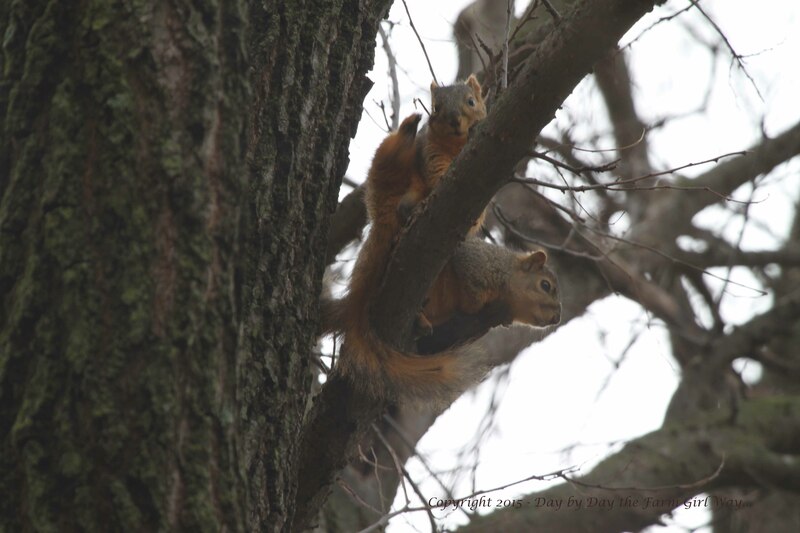 When I returned, I found the two of them still sitting quietly together on a limb of a hackberry tree. 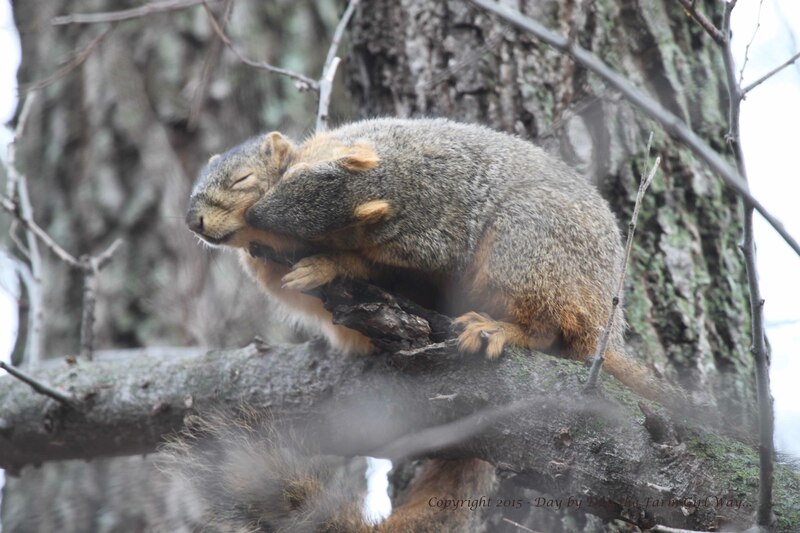 One squirrel was busy grooming the other, kneading gently at its hair, and sometimes poking its nose into the spots it had just run its paws through – as if removing parasites. I wondered if this was a mating pair and perhaps this was some kind of foreplay, but I never saw one mount the other. 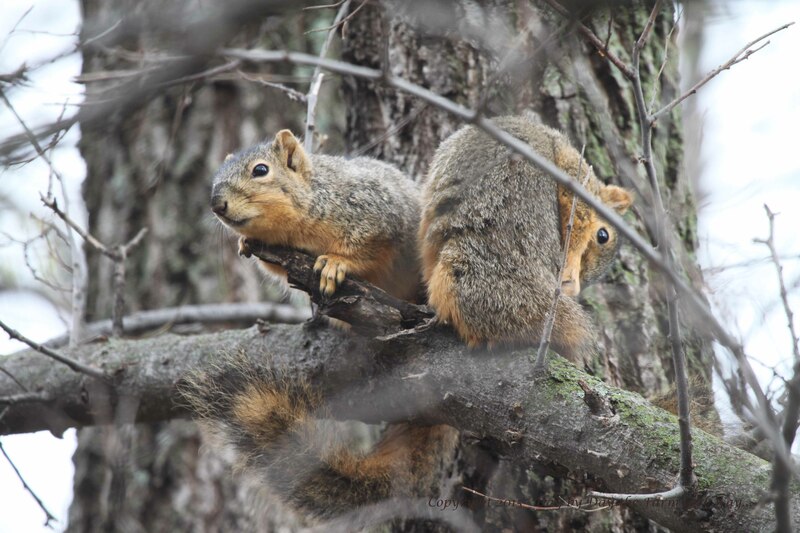 After moving around to the front side of the tree to get a better angle with my camera, I was somewhat surprised they did not scramble up the tree or scurry around to the other side of the trunk to hide from me. But now I saw why. These two juveniles were the orphans we raised last fall, Punkin and Mr. Gambini! Mr. Gambini was grooming Punkin, and she seemed to be enjoying the attention. No wonder they did not flee this pesky photographer… after all, I am still their mother too! Excuse me, I just need to get this flea on myself! Oh, what lovely ears you have! Mr. Gambini is the one with the fuzzy ears, who appears to be doing most of the grooming on Punkin. Mr. Gambini burrows deeply in Punkin’s hair to get at a flea… or perhaps he is just snuggling close. I love how Punkin’s paw and foreleg is tucked pleasantly to her chest. She seems to enjoy the attention immensely! After taking a few photographs and realizing my water was spilling over the sides of the tub, I left Punkin and Gambini to their grooming and ran back up the slope to shut the hydrant off. Later that morning, I researched this grooming activity online to gain a better understanding. 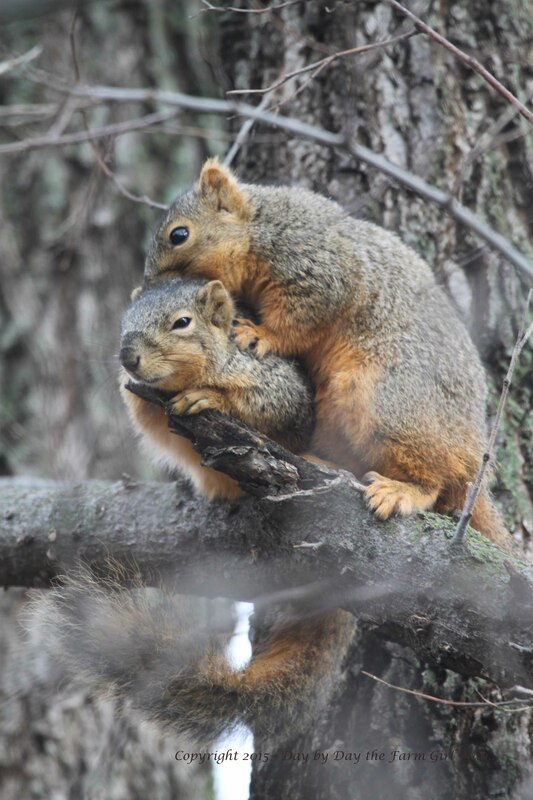 What I found was that squirrels do practice mutual grooming, and that this activity often precedes mating. I also learned that it will most likely be June or July before Mr. Gambini will be mature enough to breed, where Miss Punkin might possibly have had the ability to conceive since March of this year. Looking back over the photographs I took that morning, it gives me a warm feeling to know Punkin and Mr. Gambini are thriving and doing well in their new environment. I have often observed these two on our back porch, acting more like rival siblings while having a squabble over who gets a pecan snack first. But this day, I had seen another side, and observed a sweet moment with the two of them perched together, quietly and carefully grooming each other – and who knows, maybe even practicing a little romance in the process! This is just too cute for words, Lori, your photos could not be better. 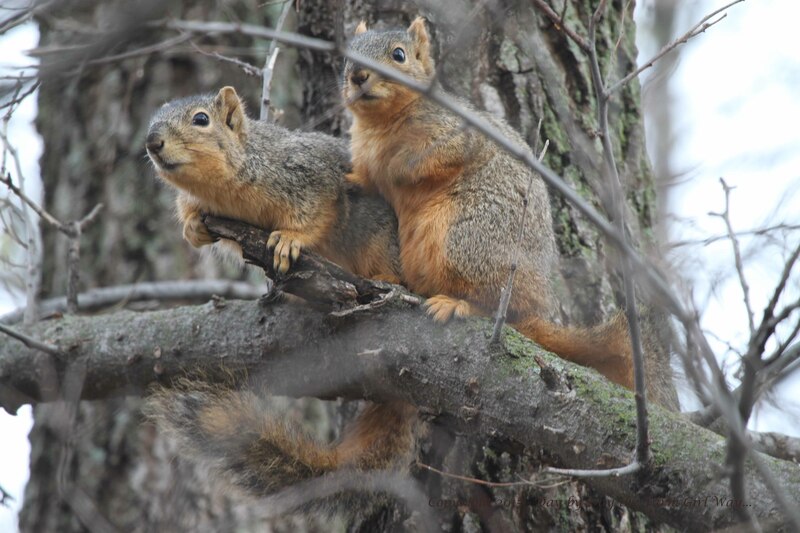 How lucky for you to have witnessed and photographed the very two squirrels that you hand raised. They were not afraid of you at all and DO REMEMBER their adoptive mama. I surely hope those two survive being out in the woodlands and manage to raise some babies of there own. Have you thought about putting up a nesting for them nearby? Or maybe that is going above and beyond what you’d want to do in order for them to be completely on their own. 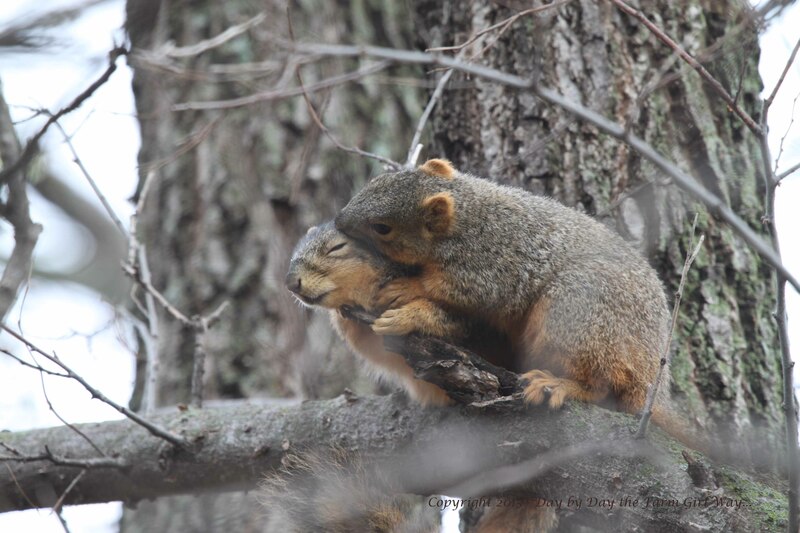 For what it’s worth or not, I’ve never had the privilege of observing squirrel mutual grooming. This is despite the fact that there are at least six or more squirrels coming to feed that I’ve once again begun putting out for the birds. 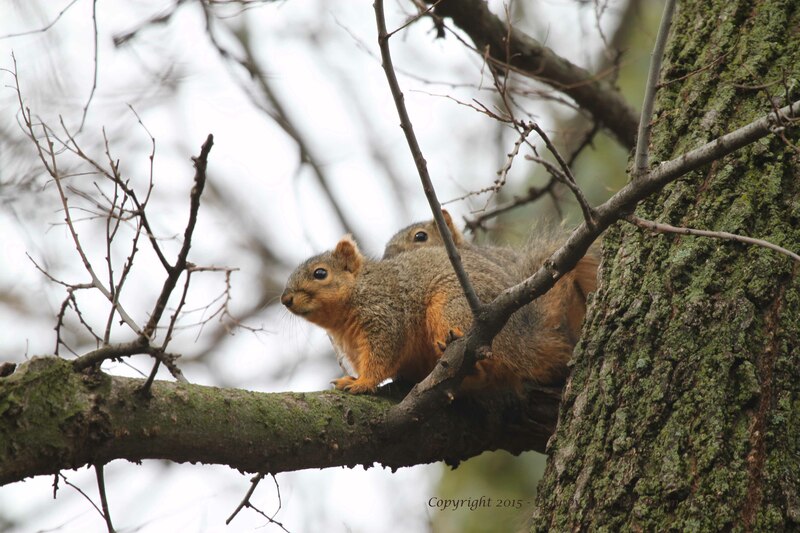 There are squirrel nest all over in the live oak, elm and, hackberry trees. I have a surplus of squirrels for sure! Yvonne, long ago we did put up a squirrel box for our first orphaned squirrel, Frosty, but he didn’t stay in it very long. He preferred making his own digs in the woods. It got chewed on by other squirrels, and nested in by various birds and finally fell off the tree a couple of years later. Punkin and Mr. Gambini abandoned their nest boxes (in the cage complex) almost as soon as they grew comfortable in the woods. They took up housing in abandoned squirrel “summer homes” – nests of twig and leaves more appropriate for summer living. 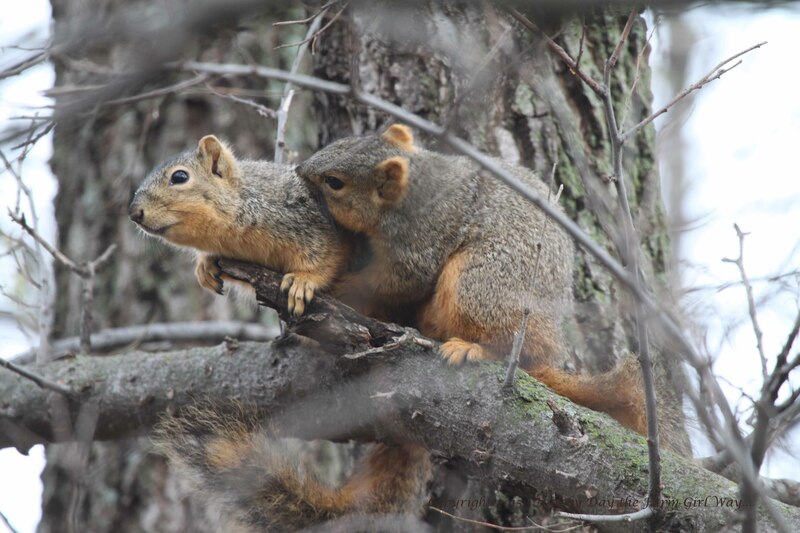 I have had opportunity to observe actual squirrel mating a few times in the past. Since they still must be careful of predators, even that is achieved with caution, keeping a bit hidden. 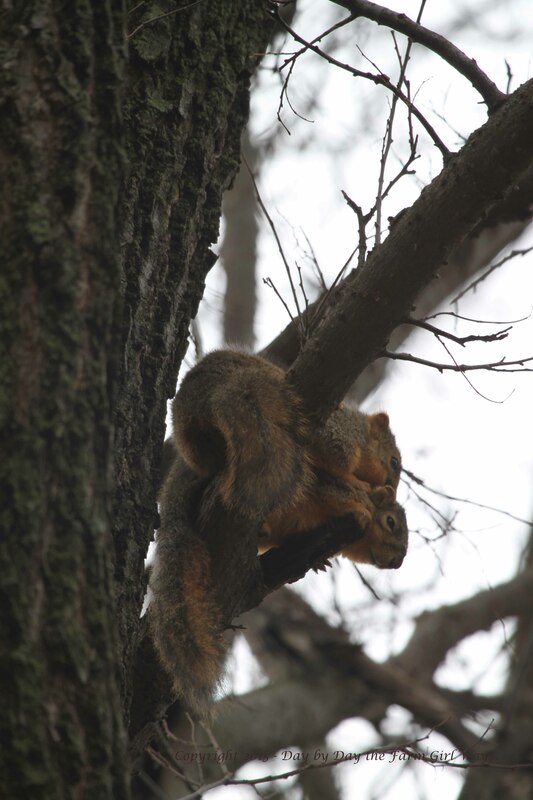 The grooming I witness here, was way up in the trees, not easily accessed with the camera. I had quite a kink in my neck from standing with my head cocked, where I could best shoot photos. Then, even when I do see something – like last summer when I happened on two turtle mating in my flower beds, I didn’t have my camera. By the time I returned with it, one of the turtles had disappeared! Nature doesn’t always make it easy for us to photograph the unusual moments. Though, it would be the biggest thrill for me to photograph or record Daisy giving birth, I realize that may never happen. Such events are well hidden. I am quite sure in the wild, and even for many human mothers, the last thing you’d want is your mother running around all excited and photographing the moment you’re in the throws of giving birth! The turtles mating had to have been something else to see. I completely understand about the nest box. Too much competition from all the rest in the neighborhood. It was an after thought and I should have known better than to come up with that suggestion. I can well imagine that you have a crick in your neck. But looking at your photos does not give me a clue if how difficult it was for you. The pics are quite good. Oh, that picture of Punkin with her leg tucked under her is absolutely adorable. 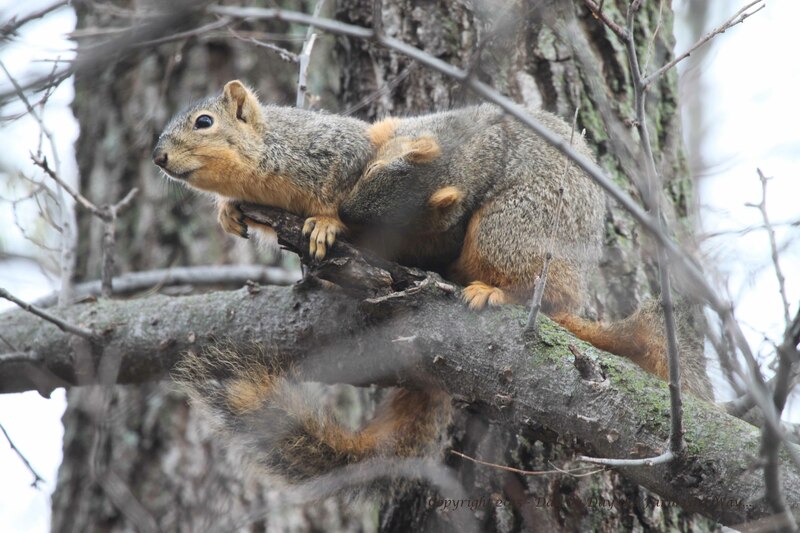 And what a coincidence that you would post these pictures today — just a few minutes ago I took a series of shots of a squirrel foraging among the buds of an oak tree outside my window. If I got some good pics I’ll put them on my blog too! You MUST be one of the luckiest and most-blessed souls on the planet to experience this heaven. And, with pictures to match, well, you’re matchless! Always refreshing to read you ma’am! Well, let me tell you… If there isn’t another squirrel around to groom, any critter will do, even a human one who insists on watching tv through the process. My squirrel used to groom my hair, exactly as you’ve shown in your photos: separating the strands, pulling, nuzzling around. We couldn’t figure out what was going on at first, until someone mentioned it looked like her mama cat taking care of her young ones. I think it’s clearly bonding behavior. My cat, Dixie Rose, loves to be brushed, and if she hasn’t gotten her daily allotment, she’ll carry her brush over to me, plop it at my feet, and wait. Of course I do her bidding! Ha ha ha! Oh my goodness! 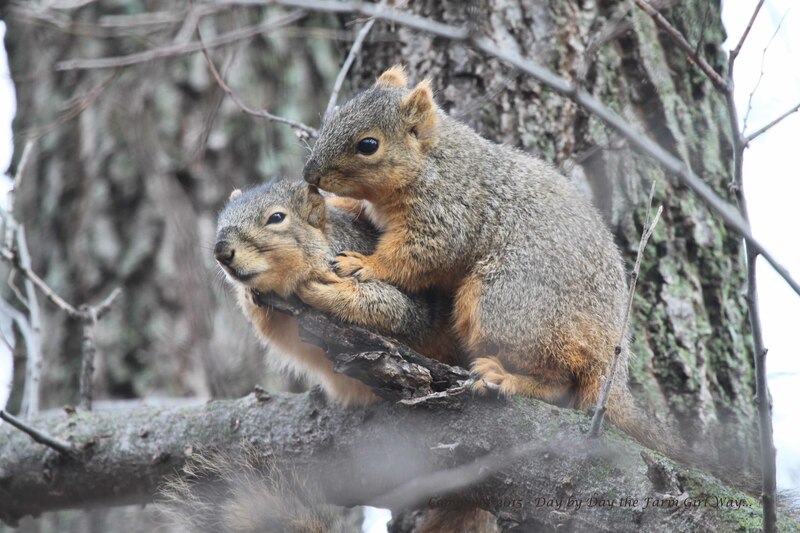 I hate to say it, but that actually sounds very soothing – the squirrel grooming your hair! Our new squirrels enjoy climbing up on our shoulders and weaving through the ends of our hair, but that would be quite something to be groomed by a squirrel. Thanks for sharing this. I could just picture it in my mind! I have never heard of a cat that carries a brush to get a brushing! You certainly have a way with critters… or perhaps they have a way of getting what they want from you. Isn’t it great to bond with animals? There’s just nothing like it! Hi Lori, The half closed eyes say it all ‘Pure Bliss’. Oh Margaret… I felt so happy to see those two together that day. It was such a delight to photograph them! Oh, Jane, you make me feel like Wonder Woman… but I am not. 🙂 Life just happens and we roll with it. I figure whatever presents itself each day is what is supposed to happen. I think this is true of all of us, and we either ignore and forge on with our own agenda, or we tap into our inner soul and we move with the rhythm of Mother Earth. The same things I share are the same things I read in your posts about adventurous hikes and the treasures you find along the way. And you brilliantly express the humorous moments too! We must delight in the day… isn’t it lovely to have perception to tap in to the power of what Nature provides us? Hi Lori! Thanks for stopping by Postcards. I’m glad to be back to sharing our adventures in Montana and abroad. And grateful that I still have some readers here at WordPress. I’m thrilled that you’re still here! That Punkin and Mr. Gambini are just ridiculously adorable. And the springtime colors. You really captured them. Great photography. Looking forward to reading about what you’re doing while we’re in Italy, which is where I think I was when I first read your blog a few years ago. Arrivederci! Happy travels!! Just keep writing and entertain us with your adventures! FD and I hope to travel abroad more when he retires in a few years. I am quite sure I’ll be asking you for tips regarding the do’s and don’ts. Your travel memoirs are wonderful to read… and you crack me up that you highlight the faux pas made and the awkward moments. We have all experienced those scenarios while traveling and they make for the greatest story-telling!